I know it has been a while i never update my blog about fitness. So here it is, a little bit of tips and motivation for you girls..just in case you're looking for some positive energy. Well, I'm not sure how many of you are still reading this site, but i really wanna thanks the people who did. I'm sorry that i can't update my blog very often like how i used to be. But no worries, I'm still here..will share everything i've learn whenever i free. When we talk about weight loss there are 2163284103293 methods out there each declaring to be better than the other. FOR ME, The only ways get rid of fats are eat healthy and exercise…Losing bodyweight can be a complicated for many people because they never want to go to the gym. They may feel embarrassed or may prefer the comfort of working out at home. ALSO...I know, there is a lot of people out there who can't commit to any of these. So, bellow are a few powerful ways to lose weight for lazy people.
" Losing weight is easier than you think "
Gain muscles is SO MUCH HARDER !! No matter what, you should always remember that losing weight only involves physical activity and a good eating plan! Set a timeline to get rid of unwanted bodyweight and write it down. Put the note with your goal somewhere you will see it everyday to remind yourself. Reduce carbohydrates! Don’t eat as much white bread, pasta and rice and you will see a change! If you want to lose weight you should definitely stop drinking soda and start drinking plain water! Avoid fried meat, go for grilled or boiled foods. You will get used to it and probably you will enjoy it more! Keep your home ‘junk food free’ so you will not be tempted to eat it. Eat most of your calories very early in the day and always eat breakfast! Try to eat less and often! Choose a healthy snack between main meals! Write your workout plan in your journal. Do several exercises a day, even when your are watching TV do ab crunches and leg raises! We all know that when we do something twenty-one times it becomes a habit. I hope you gonna use these ways to lose weight for creating healthy habits and a new lifestyle! Make it a habits! i definitely need tips for extremely lazy people! For celebrating my son’s birthday party, I was recommended to hire a local event planning pro. I had no idea that an event planner will help me in so much in preparations. These guys will definitely help you in organizing a grand party and finding some good locations! do you remember me? I faced the same acne and white head problem with you in one month ago. I go running at 7am every morning, eat oatmeal with raisin as breakfast and gonna quit supper and junk food as a challenge for myself. Before I go to my bed, I will do some legs workout, around 30 mins. It's really a hard time for me to not eating rice and bread :( May I know usually how long do you spent in running? Did you have cheat day(cheat meal)? Actually I joined gym 2 months before but then I quit now, due to the insufficient of result. I feel I am weak, I can't even do 5 push-up :( How can I built my arm strength? Do you lift heavy weight? Glad to hear that, i'm happy for you! May i know what's your height? Cause 45kg is a standard weight. 41kg is a bit underweight. You don't have to cut down carbs too much cause you're not fat. Of course i have cheat day too. But always remember. Eat healthy & a balance diet is the KEY. Hmm, I don't have a fix routine, i will just do anything that work for my body. You can start doing some home workout first before you hitting the gym. 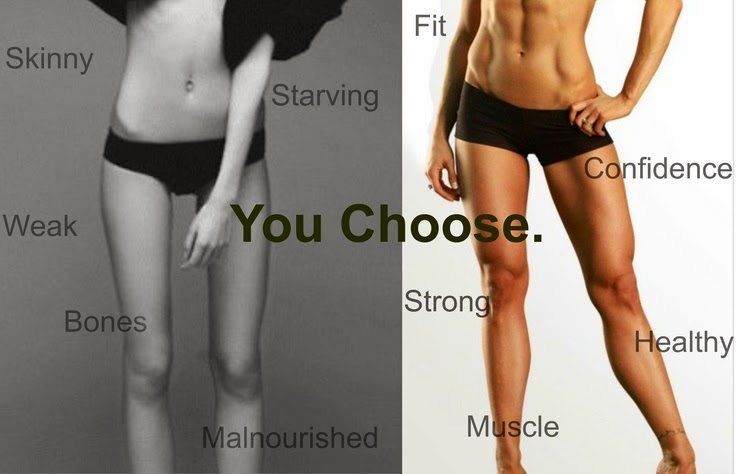 Remember, aim to be FIT.. not skinny.